Assistant Commissioner Saunders joined the AFP in 1989. File Photo. ACT Chief Police Officer Justine Saunders has resigned from her job in the AFP to take up a position at the Australian Border Force. On Tuesday afternoon (21 August), ACT Minister for Police and Emergency Services Mick Gentleman announced Ms Saunders had informed him of her decision and thanked Ms Saunders for her “outstanding” work. Mr Gentleman said since Ms Saunders took on the role of Chief Police Officer for the ACT in November 2016, he found her expertise and advice invaluable. “Assistant Commissioner Saunders brought with her a breadth of experience,” he said. “Her work with ACT Policing is to be commended. “She has begun the important process of reforming the future of ACT Policing and has also delivered strong results in combatting the criminal activities of outlaw motorcycle gangs through Taskforce Nemesis. 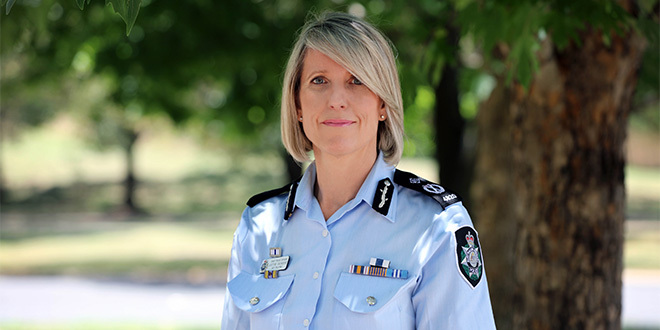 Since she joined the AFP in 1989, Assistant Commissioner Saunders spent more than 29 years working in community policing and national operational areas within the AFP, including drug importation and fraud. Mr Gentleman told ABC radio on Wednesday morning (22 August) that he would be meeting with the AFP Commissioner Andrew Colvin in the next few weeks to look about the “bright young talent” for the CPO position and expects the role to be filled in less than a month.